This chapter presents major citizenship-related legislation in Azerbaijan and Moldova and is related to unconditional jus soli (in Moldova and Azerbaijan) or its absence (in Georgia). The time period concerned stretches from the breakdown of the Soviet Union in 1991 until 2014, which saw a major policy reversal in Azerbaijan and a replacement of the initial citizenship law by a new one in Georgia (in 2015, Georgia adopted a new citizenship law, but the aspects related to jus soli remained the same). 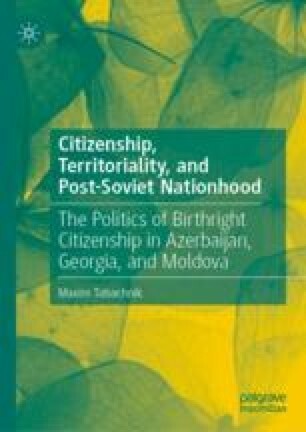 The chapter pays particular attention to the evolution of citizenship policy related to unconditional jus soli in Moldova and Azerbaijan. If the former progressed from conditional to unconditional jus soli, the latter moved in the opposite direction. Currently, Moldova is the only state in Eurasia that practices unconditional jus soli. Abbasov, Tural. 2014. Accountable Governance: Curbing Public Corruption in Azerbaijan. Good Governance Worldwide. http://www.aspaonline.org/global/turalabbasov.html, accessed February 12, 2015. Aslanov, Mubariz. 2014. Azerbaijan to Change Rules on Renouncing and Obtaining Citizenship. APA. http://en.apa.az/xeber_azerbaijan_to_change_rules_on_renouncing_211624.html, accessed December 12, 2014. ECHR to Consider Complaints About Refusal to Grant Azerbaijani Citizenship. 2018. Astna.Biz. http://www.turan.az/ext/news/2018/5/free/politics%20news/en/72040.htm, accessed November 10, 2018. Gularidze, Tea. 2003. Saakashvili Vows to Secure Favorable Business Climate. Civil.Ge. http://www.civil.ge/eng/article.php?id=5809, accessed August 1, 2015. Meждид, Фaид. 2014. B Aзepбaйджaнe пapлaмeнт внec пoпpaвки в зaкoн “O гpaждaнcтвe.” Кaвкaзcкий Узeл. http://www.kavkaz-uzel.ru/articles/243521/, accessed December 12, 2014.